We've been discussing probe loading, which is the unavoidable reality of what happens when you attach an oscilloscope probe to a live circuit. We'll now shift the discussion to dynamic range, an important topic that can be overlooked when selecting an oscilloscope probe. There are three types of dynamic range that one should understand. Each of them will influence how you set up your probe and how you set up your signal under test to most effectively get that signal into the oscilloscope's front-end amplifier. Your probe must have enough of each of these three types of dynamic range to sample the signal at the probing point and be able to center the signal on the oscilloscope's display. 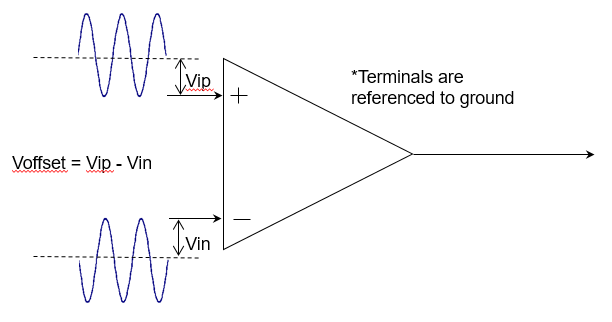 Differential-mode range, simply put, is the maximum allowable voltage between the positive and negative terminals of the probe amplifier (Figure 1). It's taken for granted that any signal that fits within the differential-mode dynamic range can be amplified by the differential-mode amplifier without clipping. Hence, this parameter is sometimes referred to in a general sense as the probe's "dynamic range." But it is also important to account for the other two varieties of dynamic range referred to above. Exceeding the probe amplifier's differential-mode dynamic range will have the same effect as overloading a single-ended amplifier. The output will go to the rail voltage and stay there. Because the differential-mode signal is the voltage being measured, it's usually easy to see on the oscilloscope's display that the differential-mode dynamic range has been exceeded. Amplifier gain and input attenuators will directly scale the differential-mode dynamic range. The common-mode dynamic range is the maximum allowable voltage between either input and the ground reference (Figure 2). Exceeding the common-mode dynamic range will produce unpredictable results that are somewhat dependent on the design of the differential amplifier. Because the common-mode signal is normally rejected and not visible on the display, users must take care to ensure that the common-mode dynamic range is not exceeded. By momentarily disabling one input and connecting it to ground, the differential amplifier can directly measure the common-mode signal. In most differential amplifiers, the common-mode range is greater than the differential-mode range. However, the common-mode range is not always symmetrical with respect to ground. Thus, in some amplifiers, the common-mode range on the positive side of ground will be different from that on the negative side of ground. Because the common-mode component is not processed by the amplifier, the amplifier gain does not scale the common-mode range. The common-mode range is scaled by any external attenuators. The offset range is important because not all inputs are sitting at the same non-zero, common-mode voltage. There could be some offset voltage between each pin and ground. Thus, the offset range is the maximum differential offset that a probe can apply to an input signal to bring it within the oscilloscope's differential-mode dynamic range (Figure 3).